So as I've been gabbling on about lately, I recently returned from a holiday to Melbourne and Brisbane. I did a couple of posts based on the cosmetics and other beauty items I packed and took along with me, so I thought I'd give a quick run-down on how they performed. The only change here was that I did indeed take my Vani-T mineral powder that I used a couple of times which was great for light coverage, especially in Brisbane's warmer weather. I did have more make-up free days than not though! I also bought another Maybelline Hypersharp Winged Liquid Liner at Chemist Warehouse on crazy sale but the one time I tried to use it, I failed so it was swiftly removed. Otherwise, I was happy with this selection. I really liked the Enbacci exfoliating scrub* - super fine grains that were gentle but effective. I was wringing the tube out to get every last drop out by the end of the holiday! The Wotnot facial wipes* were also really pleasant to use but I failed to note that this pack only contained 5 wipes which were swiftly accounted for so I ended up using my daughter's baby wipes after all. The Palmolive Body Polish in Acai Berry* shower gel was good in the way that all Palmolive shower gels are, but I wasn't really a fan of the particularly berry-ish scent. Only ended up blowdrying my hair twice, I think, but the Davroe Thermaprotect spray* still came in handy. I used the Clinique Deep Comfort body butter a couple of times but I also picked up a nice body balm from the hotel I stayed at in Melbourne that was even nicer, so much so I was even using it on my face as the Dr Hauschka Rose day cream* was way too thick for my skin preferences. I tend to get milia seeds with really heavy creams so that was a miss for me. Unfortunately, I also couldn't come to grips with the Davroe Blonde Senses shampoo and conditioner* - just couldn't work up a cleansing enough lather and my hair didn't feel adequately conditioned. Moschino Cheap & Chic I Love Love mini and Batiste dry shampoo. I didn't get to use the Bhave Gun Powder styling dust* or Enbacci pore minimiser* so I'll have to report on those at another date. My skin and hair suffered a bit while I was away so I did enjoy getting home to all my full-sized regular products, I must admit. I had an actual PIMPLE on my jaw! Gross!! 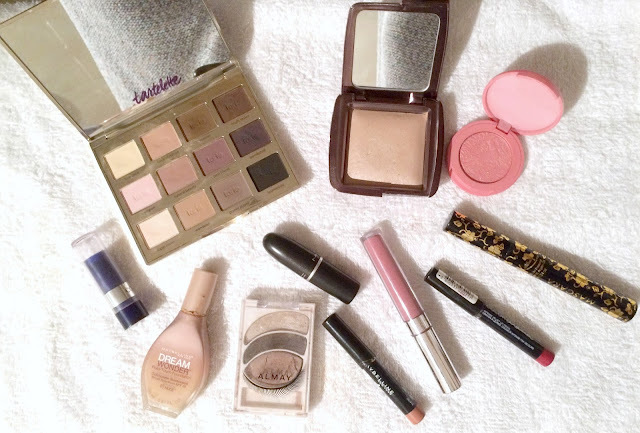 Linking up with the Monday Makeup Madness and Midweek BeYOUty link parties.